Please note that students are required to wear Winter Uniform in Terms 2 and 3. All items must be purchased from the College Uniform Shop. This includes the College Jacket, which is a compulsory uniform item for Secondary Students. Girls: Plaid skirt and pale blue blouse or navy trousers and pale blue blouse, with College jumper. Boys: Grey trousers with pale blue shirt and College jumper. Girls: Navy dress OR navy trousers with new white blouse and College tie AND College jacket. A knit College jumper is also available but optional. Navy skirt to come. Boys: Grey trousers with white shirt and tie AND College jacket. A knit College jumper is also available but optional. Year 12 Students may wear Leavers Jackets with Winter uniform. Primary Girls: May wear navy trousers with their light blue blouse. Secondary Girls: May wear navy trousers with a new white girls blouse and tie. A navy skirt will be available in the near future. 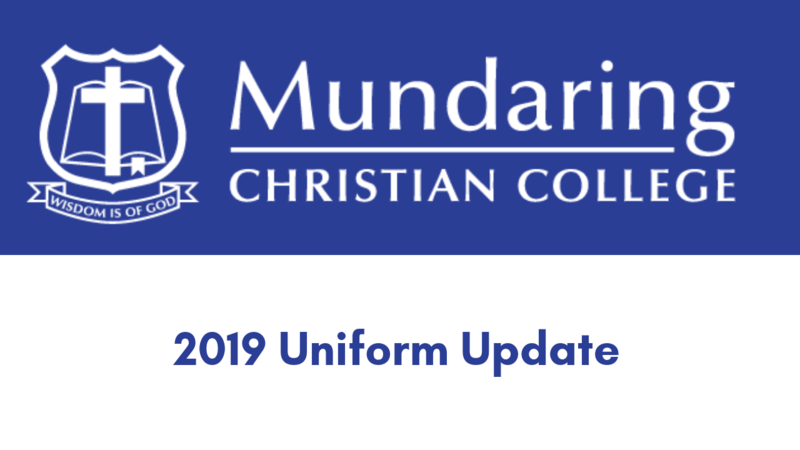 Please contact the Uniform Shop on 9295 0157 or mundaring.uniforms@permapleat.com.au.